To create a library using your operating system, create a new folder with a relevant name in the location where you want the library to be stored. This can be opened in Storyboard Pro when you require it—see Adding LibrariesAdding Libraries. Template libraries need to be organized. You can create different subfolders on your hard drive or directly in the Library view so that you can gain easy access to your assets. Browse for the location where you want to store your new library in your computer. Name the new library with a relevant name and click Select Folder. 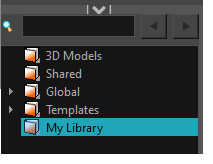 In the Library view’s left side, select the library folder in which you want to create subfolders. Right-click on the selected library and select New Folder. The new subfolder is added to the Library (although not immediately visible as it is collapsed in its parent folder). Click the root library folder containing the new folder and then click the plus (+) sign to expand it. The new subfolder appears.